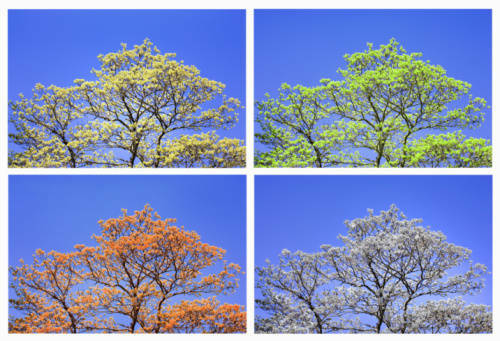 We’re hardwired to think in seasons. For our ancients ancestors, there was a time to plough, a time to plant, a time to reap, and a time to party round a fireside because outside the snow was deep and crisp and even. Think of sport: Different seasons have their different games. Think of religion: Different religions have their different holidays and festivals. Think of food: There are certain foods that we just have to have to at certain times of the year. We navigate our world by the seasons. Our world, that is, except for the world in which we make presentations. Presentations happen in a sterile land free of seasons. Free of individuality. A world without seasons is a homogenous and decidedly unsexy world of grey. Corporate style sheets and “standard presentations” are often a constraint on what we can do with presentations, but would it be too crazy to make ourselves distinctive by thinking about how we can incorporate the season into the show? It could be as simple as including some seasonal metaphors into your speech, or if you are fortunate enough to have some control of those style sheets you could add seasonal color shifts to the slides. It doesn’t have to be a slash of bright pumpkin orange, unless of course, you want it to. Flavor and temperature could be added by shifting elements of the palette towards warmer colors in winter, and cooler shades in summer. We think in seasons. How can you take advantage of that thought pattern to increase both the pleasure and the memorability of presentations? Staring at the ceiling, the back wall, or our notes while presenting can sometimes feel more comfortable than looking at the audience. By concentrating on something other than the people in front of us, we effectively find a handy blindfold. Like poor unfortunates before a firing squad, we spare ourselves the view of the guns! This is why it can be so hard to maintain eye contact while presenting. We avoid looking at our audience because we are afraid of what we might see; the blank expressions staring back at us. We are afraid we are going to see bored people, and to believe it is we who have bored them. Rather than risk such negative feedback, it’s easier not to look! People listen in different ways depending on their learning style. For many, the more they focus on your message, the more their facial expression can become the blank mask misinterpreted as boredom. Frequently, the blanker someone may look during a presentation, the more focussed they are on what you’re saying! The structure of your presentation, and how you use notes can help you in maintaining eye contact. Keep your presentation and any slides you are using as simple as possible. The more complicated your slides, the more you are forced to look at the screen behind you, and turning your back on the audience while speaking is one of the cardinal sins of presenting. For presentation notes, use bullet points to help you remember the flow of your presentation. Avoid long-hand scripts; they compel you to look at the script and not at the audience. Effective bullet-point notes allow you to pause, glance at the notes, and then bring your eyes back to the audience before continuing. Audience eye contact becomes easier as you overcome your initial discomfort. Discover how it increases your power as a presenter. You will soon find that you would no more give a presentation without eye-contact than you would drive a car wearing a blindfold.